Just like in any industry, restoration companies must be sure they are taking advantage of all of the available tools at their disposal and that they are following all the current trends if they want to be successful. One of the ways that restoration companies are gaining the competitive edge to stay abreast of their industry peers is by implementing mobile solutions. As technology more accessible and more intuitive, those companies at the forefront of implementing bleeding-edge software solutions stand to reap the greatest benefits in the long term. While it’s no surprise that mobile device usage has been steadily on the rise in recent years, some restoration managers might not realize just how much it is impacting industries across the board. According to PricewaterhouseCooper’s “17th Annual Global CEO Survey,” 81 percent of CEOs questioned said mobile advancements will revolutionize the business world in the next five years. It’s true that mobile technology has already penetrated a wide range of industries, and there are many reasons why more managers are going the route of implementing this disruptive technology. According to a recent report entitled “The Mobile Revolution: How Mobile Technologies Drive a Trillion-Dollar Impact” published by the Boston Consulting Group and Qualcomm, the top quarter of small and medium enterprises that have adopted mobile technologies in their daily operations are doubling their revenue growth and generating up to eight times the job creation numbers than those companies who have not. As noted in “The Google Shopping Guide: 2016 Edition” published by CPCStrategy, a retail-focused Search agency, 66 percent of companies surveyed said they would be unable to conduct business without using a mobile device. Further, 62 percent of respondents said they used a tablet several times throughout the day for business purposes. Executives and managers are quickly learning that there are substantial benefits for restoration companies that install and utilize mobile restoration management software. Not having to rely on paper products offers one of the most immediate opportunities for a restoration company that chooses to incorporate a cloud-based mobile software system. Although many industry insiders might consider the phrase “paperless office” to be a buzzword only used by marketers, there’s several strong reasons it’s catching on. Reducing the amount of paper used in any enterprise provides a variety of organizational, financial and environmental benefits. 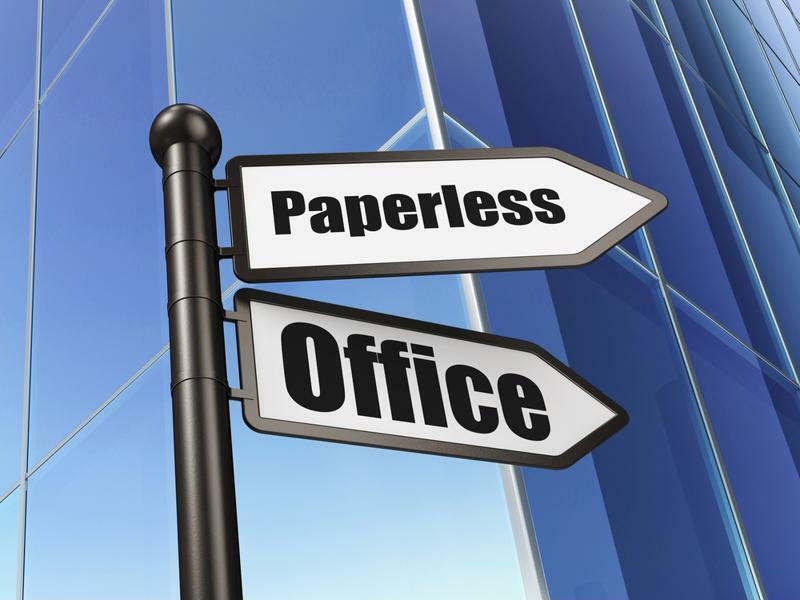 Going paperless has many operational, financial and environmental benefits. Going paperless lets restoration companies organize documents better and creates significant cost-savings opportunities since it eliminates the need for duplicative data entry. This system also is the first step to creating a mobile office, wherein any worker can access whatever crucial information is needed without having to wait on someone to first scan, copy and then forward the paperwork. In addition, files stored in a single, cloud-based repository can be easily saved and retrieved on the go, reducing the time spent traveling between the office and the job site. Without the need to constantly run copiers, scanners and fax machines, companies can also save money by not having to pay for electricity, maintenance and upgrades for expensive office equipment. A cloud-based paperless system will also generally include automatic data backups, which greatly lowers the chances of important files or documents becoming lost, damaged, corrupted or otherwise mismanaged. Less paper and more digital backups lessen the exposure to risk and the potential for delays associated with a setback caused by a loss of data. Further, there’s also environmental benefits to going paperless. As noted by Paychex, copy paper used in an office setting accounts for 20 percent of U.S. paper usage. By reducing the reliance on this natural resource, companies can see tangible environmental improvements. Restoration companies must track and manage a large amount of insurance claims and other compliance documents. While going paperless can eliminate the mess and cluster this stack of documents can create, it’s also important that all team members have real-time access to all of the relevant data. Providing this real-time access lets everyone share and follow all claims and compliance regulations throughout the entire restoration process, thereby ensuring no important filings fall through the cracks or are overlooked. With a dedicated, mobile restoration software system, every person from the executive to the individual field technician has real-time access to the most crucial and necessary data, which ultimately improves the overall transparency involved in both internal and external communications. Clients who know they’re getting immediate, accurate responses to their communications will have more trust in the company and be more likely to recommend them to other industry professionals. In the CPCStrategy survey referenced above, the reason most businesses cited for using mobile devices was for saving time and increasing productivity. Having real-time access to all the data and contact information necessary to complete a restoration job helps companies boost efficiency in several ways. For example, Next Gear Solutions’ DASH lets managers customize and configure the routes and processes for completing work and creating more streamlined operations. By creating alerts and sending gentle reminders to all of the relevant team members, the DASH systems allow managers the ability to track and follow all tasks, thereby ensuring each job is completed on time and under budget. With improved workflows and more precise budgets, efficiency increases and so too does productivity and profits.